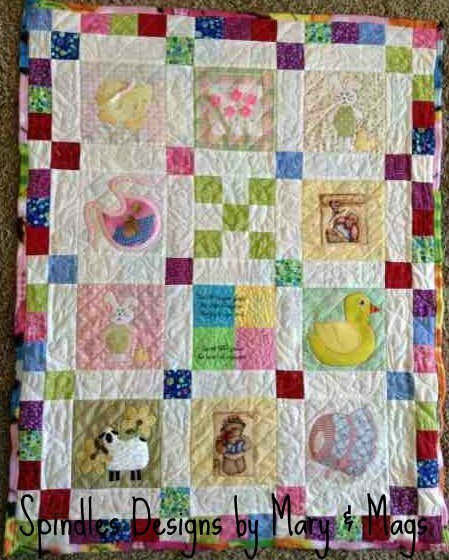 Just after my daughter was born the quilt group we go to made me some adorable blocks to be made into a little quilt. Well, it has been two years and I have finally finished the quilt. 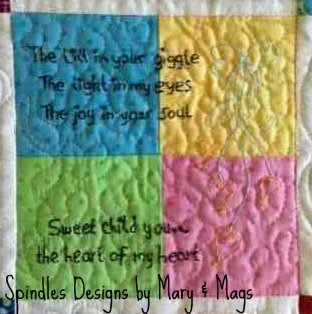 I chose to use it as my first official quilting project, not just practice squares anymore. I found some fleece in my stash to use for a back and got to it. I was too self conscious to just go without a guide or direction so I drew pretty much everything I was going to quilt. I found that after a while, I would get impatient with myself, thinking it should be going faster. I have lots of mistakes that could be picked out and fixed, but I don’t have the patience to pick it out. In the end I was pleased and thought it turned out really well for my first project. 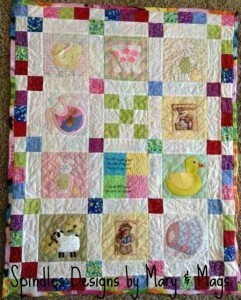 As the quilt is for Savannah, I put her name on it! I did not want to stipple the entire quilt, in fact I only stippled one block. I do like how it turned out though, I may use more of this technique on future projects. I got a little carried away with the hearts though… they are all over the quilt. In the end, a successful adventure. Now on to the next project, so I can quilt it too.